The telltale sign for many that it’s Holy Week is arriving to church close to Mass time to find a crowd still gathered outside. Many of them, especially the priests and deacon, are wearing red, the color of bloodshed and martyrdom. There is also a fair amount of green from palm branches the faithful hold, some fresh and bold like those that welcomed Jesus back to Jerusalem. Others are a bit drier, paler and finger thin — and before you know it, several Catholics have fashioned their palm into a cross. All of that is just the beginning of Holy Week, a time in the Church when Catholics more intensely remember the passion, death and resurrection of Jesus in atonement for the faithful’s sins throughout time. As such, there is far more for the senses to absorb. 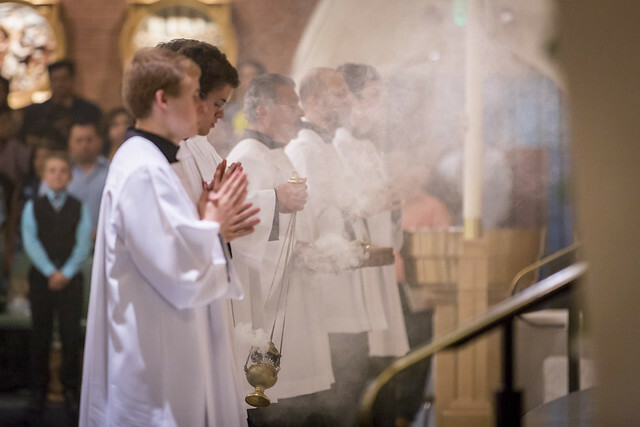 “It helps to connect our whole body to the Mass, which is good because the purpose of the Mass is to transform us,” explained Dcn. Doug Bogart, cathedral deacon and associate director of education and formation for the diaconate. Palm Sunday has Catholics holding, and possibly waving, the palm branch during a Gospel reading at the onset of Mass, often outside. Jump ahead to the Triduum, which begins Holy Thursday, and a detail only recorded in John’s Gospel is not just recounted but demonstrated: the washing of the feet. Bishop Eduardo A. Nevares at St. Anne in 2018. “The bishop or the priest acts out the works of Jesus in a very real way,” often for a pre-selected few, Dcn. Bogart said. The sensation of warm water being poured over one’s daylong worn-out feet is the same as it was for Jesus’ first Apostles. This act of humility was especially significant as the feet were considered the dirtiest part of the body since they’d be exposed to the ground and to the elements. The Mass pauses — the Triduum continues through the Easter Vigil — at the end of the night with reposition of the Blessed Sacrament. It’s often done apart from the church to better illustrate how Jesus went away to pray in the garden after the Last Supper. St. Mary’s Basilica opens up the friar’s garden for the occasion. The choir offers Gregorian chants for a bit, followed by silence and night prayer. Good Friday, continuing the Triduum, brings two key feelings: that of someone’s lips or hand touching the corpus, or body of Jesus, or other parts of the crucifix during the Veneration of the Cross and the intangible feeling of loss or emptiness. A woman kisses the corpus during the Veneration of the Cross during the Good Friday service at Ss. Simon and Jude Cathedral in this March 30, 2018 file photo. (John Bering/CATHOLIC SUN) Click here for video of Veneration of the Cross. “There’s a void because Jesus is not there,” Dcn. Bogart said. One workshop aims to combine those feelings. The Franciscan Renewal Center, “The Casa,” is hosting its second “It Is Finished” sculpture workshop at noon on Good Friday — in addition to Stations of the Cross and the Good Friday service. Students will paint small ceramic pieces and connect them via wire loops to create a personalized crucifix. “It’s just a way of praying with your hands and taking time on that particular day to do it,” said Rick Hardy, director of adult education and retreats at The Casa. Students sculpted Jesus’ face out of clay in 2017 and created a horizontal beam over the shoulders to make the cross. Good Friday also has plenty to see, especially for the many churches that hold a “living” Stations of the Cross. It’s often the youth who portray Jesus and the others, but at St. Henry Parish in Buckeye, it’s adult parishioners who make the outdoor journey all too real. The stations end atop a small, nearby hillside where three life-size crosses blur the lines of reality when men are hung there. A tomb isn’t far off. All told, about 20 costumed actors rehearse twice a week throughout Lent to ensure the movements seem natural. Some 300-500 people attend. “They get very emotional when they’re watching it,” said Lupita Uribe, who helps coordinate the effort. Living Stations of the Cross in 2018 at St. Henry Parish in Buckeye. “There’s always a role for them to play, if not with the main actors, the crowd too. They call, ‘Crucify Him!’” or “Crucificarlo!” since the Stations are presented in Spanish. Those words bring a harsh reality to the temporary removal of Jesus from Earth. It’s hinted at the end of Holy Thursday when volunteers strip the altar and the tabernacle door remains open. “The Lord is not in the building anymore. It feels empty. His presence has left the building in a very real way,” Dcn. Bogart said. 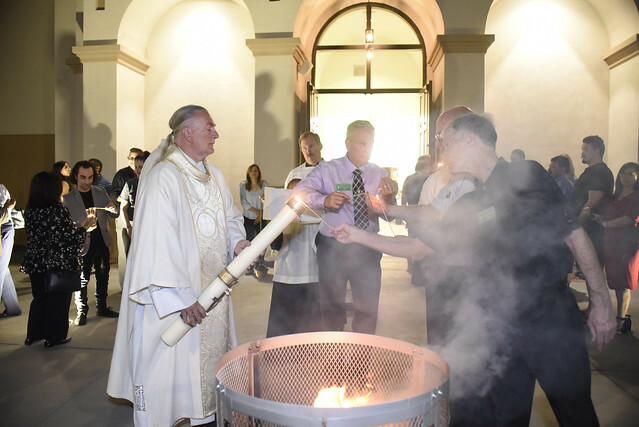 But it returns at the Easter Vigil, concluding the Triduum Mass, in which the theme is “darkness into light.” The vigil begins in darkness, sometimes at an outdoor fire pit. At St. Helen in Glendale, prayer intentions that the faithful wrote on slips of paper throughout Lent will be burned in this fire. The priest lights the Paschal candle from that large flame. That candle, which can be 5-foot tall or taller like the one at the basilica, then leads the procession inside where each individual receives a small taper candle. Each one gets lit from the Paschal flame. “You see the light spreading as people come in. There’s this warm glow and the [Paschal] candle goes prominently to the front of the altar. It’s really dramatic to see,” Stevenson said. The candles illuminate a series of readings showing the Church’s salvation history. There are nine possible readings with the Church requiring at least three from the Old Testament, one from the New Testament and the Gospel. Psalms, silence or canticles or music are interspersed. As soon as the priest says, “May the light of Christ, rising in glory, dispel the darkness of hearts and minds,” everyone blows their candles out and the electric lights come on. At the basilica, it’s a matter of doing so strategically among 20-some light switches. The lights over the reredos come first followed by the main altar and altar candles and then everywhere else. “The big picture is the beauty of how we express in our Catholic faith that stuff matters. We’re not disembodied spirits separated from physicality,” Dcn. Bogart said. Incense is another Holy Week staple, one that is often both seen and smelled. “It helps us to recognize our lived relationship with Christ in a way. The smoke of the incense can be seen as our prayers rising to heaven,” Dcn. Bogart said. Some churches regularly use incense prominently prior to the Gospel reading and Liturgy of the Eucharist. The rest should expect the smoke from lightly burning frankincense or another fragrance to fill the air during Holy Week Masses. At the Vatican, Holy Thursday also means the distinct fragrance of the new chrism oil. 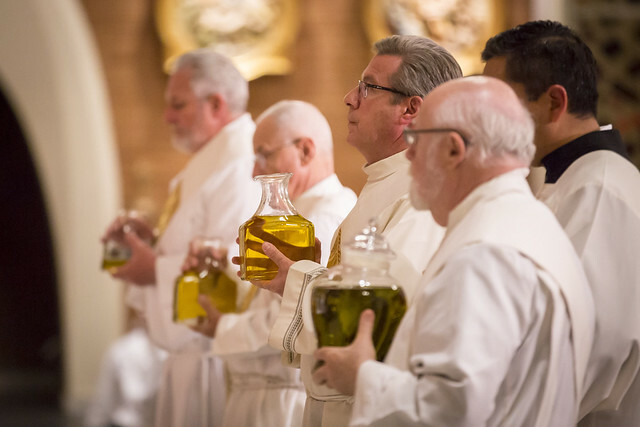 Out of practicality to allow more priests to attend and renew their vows together, the Diocese of Phoenix holds its Chrism Mass the Monday of Holy Week at Ss. Simon and Jude Cathedral. Deacons, religious and laity also fill the pew. 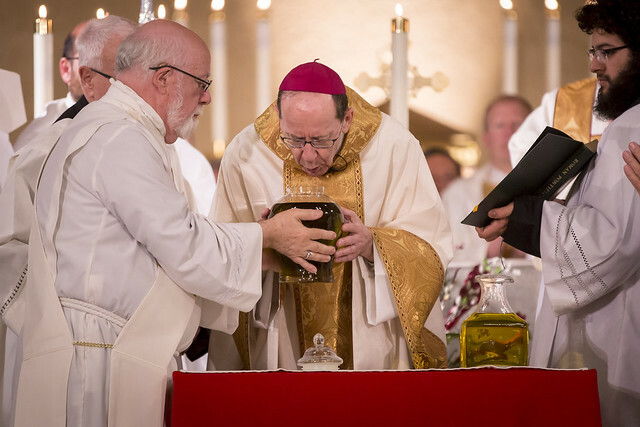 The bishop gently blows into a large, clear jar of chrism oil, a gesture that symbolizes the infusion of the Holy Spirit. It’s that amber liquid that will transmit God’s grace and, with that, what some Church leaders call “the new Christian smell.” It’s better than a new car smell, they quip. But more seriously, the newly baptized and confirmed Christians beginning at the Easter Vigil and beyond are being anointed for battle, Dcn. Bogart explained. Those watching from the pews get a sense that something special is happening, too, as the blended fragrance of olive and balsam oils fill the air. Throughout Holy Week, distinct sounds also fill the air. There are the trumpets and fuller choirs on Palm Sunday and at Easter; and perhaps the nailing of “Jesus” to the cross on Good Friday. The latter is a sound the faithful at Corpus Christi in Ahwatukee have grown accustomed to. Throughout Lent, Catholics wrote a personal vice or life improvement goal and hammered it to a cross in the vestibule. Parish leaders encouraged the faithful to pray for that person each time they heard the hammer. Good Friday is also about profound silence, though. One of the many periods of silence during the Good Friday service is cued up. There is sustained rejoicing beginning at the Easter Vigil and continuing through the Octave of Easter. Stevenson advised paying attention to when the darkness is broken at the Easter Vigil. The priest intones “Gloria in Excelsis Deo” and the church bells ring during this time. “That’s the great moment that the Gloria harkens again because it hasn’t been sung throughout Lent,” Stevenson said. The same goes for the Alleluia, which is restored after the New Testament reading. The priest solemnly sings “Alleluia” “and he’ll do it three times and a tone higher each time just to heighten the solemnity,” Stevenson said. More “Alleluias” resound at the end of the Easter Mass. A final thing to listen for during Holy Week and a little beyond: the priest or deacon’s double Alleluia at the end. It’s something only heard during the Octave of Easter.